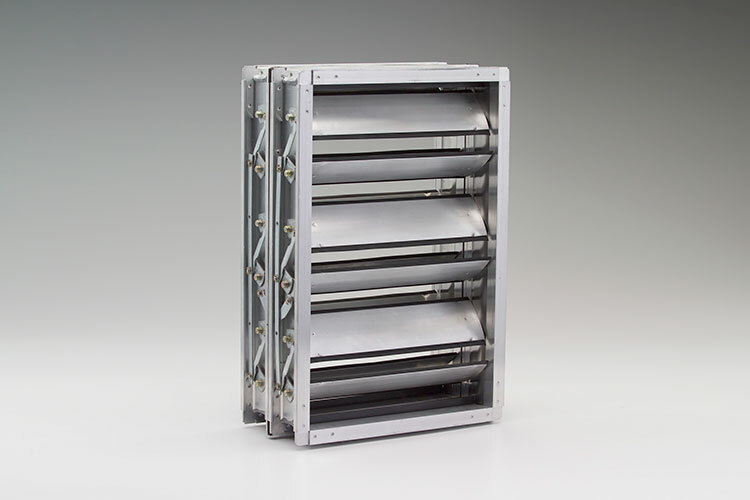 The new TED40x2 low-leakage insulated control damper from Ruskin® features insulated airfoil blades, which offer greater strength, produce less sound, provide greater sealing ability and reduce static pressure loss. With an 8-inch frame and aluminum construction, the TED40x2 is proven to be insulated more efficiently than conventionally insulated blades. When closed, the damper traps a minimum 4 inches of dead air space between the double blade assembly. Additionally, a thermal break between frame sections prevents heat transmission through the frame. As an added feature, blade cavities are filled with urethane foam. The damper’s unique double-edge blade seal design enables higher pressure on either side to assist in blade-to-blade seal shutoff. Seals are mechanically locked in extruded blade slots, but can be easily replaced in the field. The TED40x2 also features linkage concealed out of the airstream for low maintenance and reduced air turbulence. Like all products in the Ruskin offering, the TED40x2 is covered under the Ruskin five-year limited warranty program. The program – recently extended from one year to five years from the date of delivery – demonstrates the company’s commitment to quality and makes it easier for engineers to specify Ruskin products.